When you try to edit the tags when asking a question (or edit the tags of a question when having less than 2 k), a box how to tag appears on the right, showing some general help on tagging. The content of this box is site-specific, for example it is individualised on Anime & Manga. Now, we have a handful of tags that are prone to being misused, namely phd, masters, thesis, research, publications, university, students, professors, conference and graduate-school. In fact I removed the research from what feels like 100 questions in the last months. Would it be possible to add a paragraph or two to the how-to-tag help box warning users not to misuse these tags, do we actually want this and if yes, how should this help text be worded? With respect to the latter, you might want to cannibalise this help text I wrote on Welcome to Academia SE on the same topic. Use tags that describe what your question is about, not what it merely relates to. For example almost every question on this site is eventually related to research, but only questions about performing research should be tagged research. 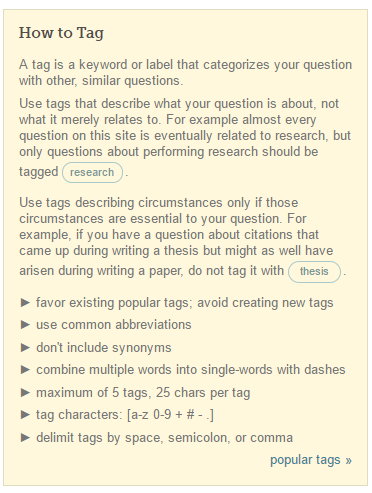 Use tags describing circumstances only if those circumstances are essential to your question. For example, if you have a question about citations that came up during writing a thesis but might as well have arisen during writing a paper, do not tag it with thesis. I think we don't need to worry about high-usage tags, if they are for general categories. A post can have multiple tags, so it's OK if one or two are quite broad. We're somewhat more concentrated, but not so much that I think it's worth worrying about. Not the answer you're looking for? Browse other questions tagged feature-request status-completed tags new-users . Are ([career], [career-path]), and ([job], [jobs]) tags synonyms? Need for a tag to describe teaching/student evaluations? How to use Stack Exchange answers in the Tags wiki? What's the difference between “supervision” and “advisor”?